Snack Girl has been holding out on one of her own favorite snack recipes. I like to think of it as a BLT without the B or L.
I slap a little mayonnaise on a slice of whole grain bread, slice up some 'mato, and shake some salt on the concoction. So yummy and very good for you as you are eating fruit, whole grain, and just a wee bit of mayo. The key is to use about 1/2 teaspoon of mayonnaise which allows the tomato to shine. I love tomatoes. Yes, that is Hellmann's mayonnaise made with olive oil and cage free eggs! Where am I living? Spain? Mayonnaise is traditionally made with oil, egg yolk, and maybe some lemon juice or mustard depending on what you like. It is a pretty simple recipe really and one that I have never attempted. I just buy my mayo at the store - and I usually buy Hellmann's. So what is in this Hellmann's reduced fat mayonnaise with olive oil? 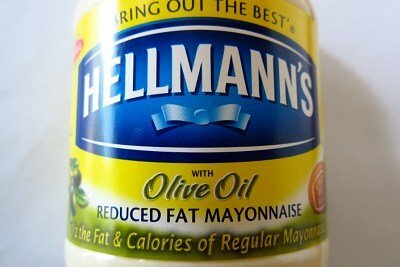 My assumption was that Hellmann's was using olive oil as THE oil in the mayo and that sounded awesome. But, alas, they are still using soybean oil in the mayonnaise. The bolded ingredients are INGREDIENTS NOT IN REGULAR MAYONNAISE - this statement is on the side of the jar. So, what Hellmann's (or Unilever since they are the parent company) did was add water and starch to reduce calories, and a little more salt to add flavor. How did it taste? I found myself spooning mayonnaise into my mouth this morning (the things I do for this website!) and I noticed that the lower fat version tasted sweeter and less flavorful. Then, I used both of them to make my favorite snack and I found myself slathering more of the low fat version to make it taste better. You see, if you water down mayonnaise it will lack what mayo is supposed to have - awesome flavor! You know, the problem isn't that full fat mayo is calorific. The problem is that Americans take baths in the stuff. Anyone remember the Arby's "healthy" Chicken Salad sandwich with 44 GRAMS of fat? That was mayonnaise doing the dirty work. Remember one teaspoon of regular mayonnaise is only 30 calories. If you can get the serving size of mayonnaise down to a reasonable amount, then you don't have to give up the good stuff! And, you won't be spending $4.80 on watered down, starched filled, pseudo mayo. How do you deal with mayonnaise? Slice tomato with serrated knife into four slices. Toast bread in toaster and slather mayonnaise on both slices. Add slice of tomato, sprinkle with salt, and enjoy! I tried the olive oil Hellmann's and think they should stop manufacturing it. The taste is incomparable to the original mayonnaise. I don't really use that much mayonnaise anymore, so the calorie content doesn't bother me. If you are a true vegan and you still want mayo, try Veganease (not sure if that is spelled quite right) but it is very tasty and is made with no eggs. I love it and use it all the time. Shame on Hellman's for misleading people. That jar should say Made with Soybean Oil. But then that wouldn't sound as healthy. Did you happen to look at the difference between regular Hellmann's and Hellmann's with olive oil (NOT the reduced fat) kind? oh, i'm no help here - i've always hated mayo! however, i do love heirloom tomatoes at their peak of freshness in the summer! those babies are so good, i eat them like apples! 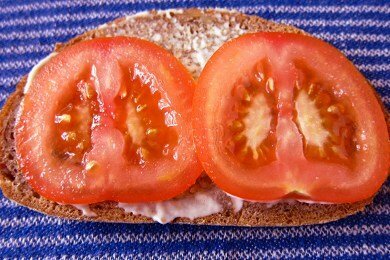 I adore the taste of homegrown,fresh Jersey Beefsteaks on Wonder White (although I know that Whole Wheat is better for me)with MAYO!!!! and of course salt and pepper!!. Now this is Summer to me! My favorite snack is tomatoes from the garden sliced up and topped with lowfat cottage cheese and salt/pepper. Sometimes, I also add basil. Add a slice of cucumber and this is MY favorite summer treat. I had to make homemade mayo in a food science class in college. It was one of the nastiest things I've ever put in my mouth. The whole class turned out like that. Not at all creamy like the store bought version. Hey Lisa, I think your math is slipping. Either that or you aren't calling Hellmans "real" mayonase. You said a Tbs of Hellmans has 90 calories, then later you said 1 tsp of regular mayo is 19 calories. Wouldn't that be 30 cal? Just trying to clarify, not be a pain. i GREW UP on tomato sandwiches! we were southern, poor, had our own garden... that was good eats, all summer long! that and fried (i know, i know) squash. slice thin, shake in a bag with some flour salt and pepper, lightly fry in a pan. ah, food nostalgia. @Shanna - you should know I don't know how to divide by 3! oops. I fixed it - thanks for the help. Sometimes, I wish for an editor. love it, but good tomato is hard to come "buy". & they cost a lot to buy. gardening is not for me. I agree with hautemomNC.. I actually like the Kraft stuff with olive oil. I don't notice the difference. Great snack!